This Mother’s Day, make your family history project all about your mother by conducting an oral history interview designed for her. Capturing her story is an important part of documenting your family history and one you don’t want to miss before it’s too late. Take a moment to research your mother’s history before you begin. Researching her past before you start the interview process will save you time in the long run. Begin with what you know about Mom. If you know her family stories, jot them down. Bring old photos and papers of your mother to jog her memories. Talking about the past is also a great time to bring up the subject of family legacies. Your mother's papers and photographs, as well as her oral history interview, can be easily organized in a family archives. Create an outline before you start. Chronological is best, starting from her childhood to the present. You will likely find that you and mom won’t follow along exactly as stories may cause her to jump around in time. That’s perfect; ask about dates for the stories so you can keep track. If you’re planning to publish the interview, you will need your mother’s written permission. While this may seem formal, you don’t want to risk of sharing something about her life that she doesn’t wish to share. If you’re going to publish stories, chances are you’ll need a legal agreement. (I discuss copyright fundamentals here). 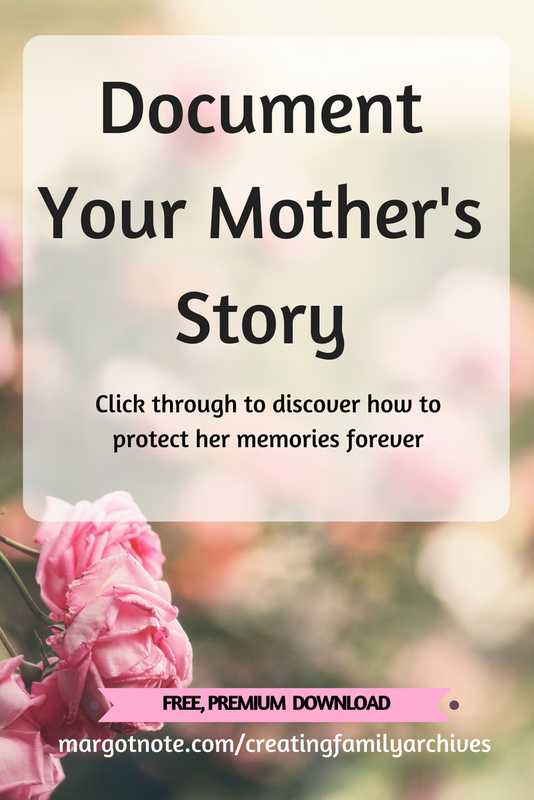 Skip this step if you are only sharing your mother’s story with family members. Ensure Mom’s stories aren’t lost by transcribing her interview as soon as possible. Whether you used an audio or video for the interview, review what you created and make notes. I’ve created a list of 40 questions to ask your mother to celebrate her life. They are crafted to give you more than a yes or no answer and tailored to uncover information about the most important woman in your life. Interested in interviewing your father as well? Check out the list of questions I created to start a conversation with him HERE.